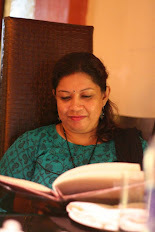 This summer I discovered a refreshing drink made of Kiwi in Priti's Indian Khana. Whenever I saw her post, I tried it immediately and my whole family loved it. So far, we used to have the fruit by itself, but now after discovering this keeper drink recipe of Kiwi, I'm relished it mant times. This drink is just an amazing thirst quenching. During summer, we love more drinking than eating a fruit. So, add this fruit in your diet as it'll give your body a load of benefit. Kiwi fruits are rich in many Vitamins, flavonoids and minerals. In particular, they contain a high amount of Vitamin C (more than oranges), as much potassium as bananas and a good amount of beta-carotene. Kiwi also has an remarkable amount of vitamin E & A, too. It's a powerful anti-oxidant which protects our body from free radicals. Divide kiwis into half first. Throw the black seeds from the middle. Then scoop out rest of the green part. Take scoop out teh green flesh into a blender. Add water, lemon juice and sugar. Blend well. Serve into tall glass, throw some ice cubes. Enjoy the drink yourself or please your sudden guest in Summer. Linking this bookmarked recipe to Priya's Bookmarked Recipe Event . That sounds so refreshing n what a lovely color it has! 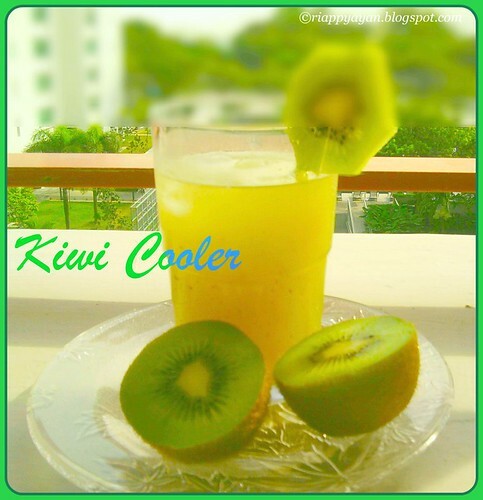 Kiwi cooler looks amazingly refreshing and superb. Nice and healthy refreshing drink. wonderful drink, very refreshing, following u :)..visit mine too..